I’ve been waiting for things to heat up in the Android tablet sector—beyond just Plain Jane Nexus tablets—and I’m glad to see that Huawei’s taking the first punch of the year. The company announced the premium MediaPad N2 10.0 tablet at its CES press conference Tuesday. The name doesn’t exactly roll off the tongue, but what’s on the inside will impress you. Huawei also announced two new finishes for the Huawei Watch, including a bedazzled version, as well as its new flagship device, the Mate 8 smartphone. It’s too bad we won’t see the latter come stateside any time soon. The pen comes with the tablet, but there’s no where to stow it. You don’t see too many 10-inch tablets in the Android realm, but this one packs all the right stuff in the right places. 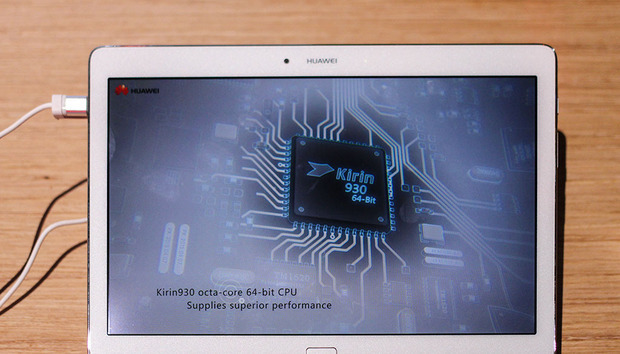 The MediaPad N2 10.0 runs on a 2GHz octa-core Kirin processor, and this is the first time that we’re seeing Huawei’s proprietary silicon popping up here in the U.S. The tablet also comes in two variations: a 16GB version with 2GB of RAM, and a gold 64GB version with 3GB of RAM as well as a pressure-sensitive stylus. The bundled stylus is the width of a Sharpie. I went hands-on with the 64GB version of the N2 because I wanted to check out the bundled stylus. Unfortunately, it’s not dockable like the S-Pen on Samsung’s older Galaxy Note 10.1, so you’ll have to stow it separately if you want the added functionality. And to that end, I wasn’t entirely clear what to do with the stylus. There were a few note-taking apps and widgets available on the N2, but they were hard to find. I managed to use one feature of the stylus where I held down the bottom-most button to take a screenshot and then wrote over it. Unfortunately, that’s all I managed to do in the ten minutes I had with the device. I had no idea what I was doing, so I just wrote “What?” on top of a screenshot of the Home screen. Everything else about the MediaPad N2 10.0 makes sense, though. For instance, I thought that the 16:10 aspect ratio might bother me being that I’m so used to 4:3 on the Galaxy Tab S2, but it mostly eliminates those annoying black bars that appear onscreen when you watch widescreen-formatted video. The N2 also boasts four speakers provided by Harmon Kardon: two on the top and two towards the bottom. They can get pretty loud, and I was able to clearly hear the music playing despite the noisy demonstration room. The MediaPad N2 is also thin and sturdy, and though it’s just a tiny bit heavier than the Tab S2, it’s still lighter than the latest Nexus tablet offerings. I’d rather carry this thing in my bag over a Pixel C any day. I will admit that I cringed when I heard a Huawei executive refer to the Watch Jewel as a “lady’s watch,” but that’s what it is. Both the bedazzled Huawei Watch Jewel and the classic Watch Elegant are two extremely gorgeous Android Wear watches that are meant to cater to the female crowd. They’re smaller, too, so they’re more comfortable on thinner wrists. It’s possible this watch is a tad too fancy for me. My only issue is that I’m not fancy enough to justify wearing 68 Swarovski crystals on a smartwatch, but I like that Huawei’s finding its niche in an increasingly saturated smartwatch market. It’s going for the gold—quite literally—and hoping that those with high-end tastes will find its selection of watches particularly palatable. The Huawei Mate 8: a phone you may never get to use. On paper, the Huawei Mate 8 is a spectacular flagship device. It has a Kirin 950 octa-core processor that’s supposed to be 100 percent faster than previous models, not to mention a 6-inch HD display, a 16-megapixel rear-facing camera, and up to 4GB of RAM. It also offers fast charging, a faster fingerprint scanner, and Android 6.0 right out of the box. It’s bigger than the Galaxy S6, the Galaxy Note 5, and the LG G4, but not unwieldy—I’m also used to using bigger phones now that they’ve become the norm. Huawei is mostly to blame for the entire phablet trend in the first place, so it’s natural that the company will continue to produce giant phones. The bronze-gold finish is particularly attractive. One thing I’m not particularly keen on is Huawei’s EMUI overlay. It comes standard with Huawei’s devices, and though it looks nicer than other third-party interfaces, I haven’t used it enough to see if it slows down over time. I did see one warning sign, however, when I discovered that the awful Clean Master application comes preinstalled on the Mate 8 (I didn’t check to see if it was removable). That app is known to turn spam-like, like OS X’s MacKeeper, and I’m baffled that a company as trusted as Huawei would bundle it in with its most prized flagship device. Regardless of how stylish and powerful the Mate 8 is, there’s nothing to get excited about. If you live in the U.S., you may likely never see this phone—at least not through any of the major carriers. I don’t think it means we’ll never see any marquee devices from the Chinese company, though. After all, with the Nexus 6P—which is now available in gold—Huawei is building its presence in the U.S by starting small and aiming big.